NaMo Bandra Blasters’ batsman Eknath Kerkar talks about playing the waiting game. In a world where professionals are happy to stay as hired gunmen in franchise cricket, playing first-class cricket for his state team remains Eknath Kerkar’s long-awaited dream. A familiar face in the Mumbai Ranji Trophy squad for the past five years, he has only made it to the playing eleven three times, that too in the shortest format. 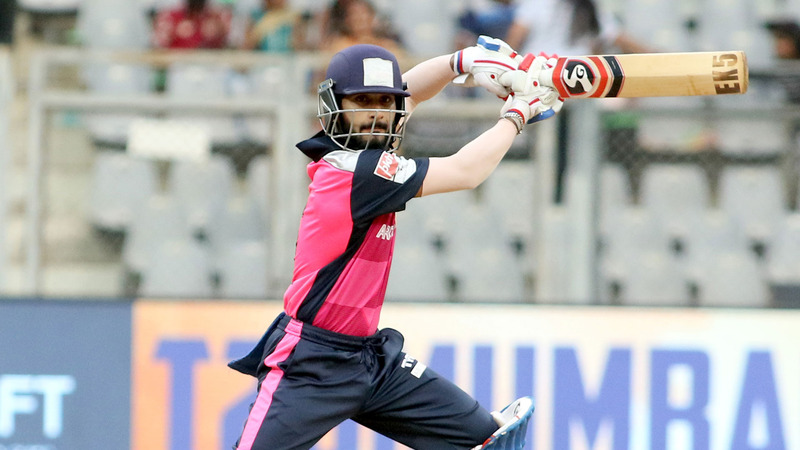 In the recently concluded T20 Mumbai, opening the batting for Bandra Blasters, Kerakar made an unbeaten 36-balls 50 that took his team into the playoffs. Speaking to T20Mumbai.com, the 24-year-old spoke about his hunger for the game. When did you decide to take up cricket professionally? I started playing cricket when I was seven-years-old. Once I was selected in the Mumbai U-16 team, I started taking my career seriously. What difficulties have you faced as a cricketer on the Mumbai domestic circuit? I haven’t made my first-class debut for Mumbai. When you go through a period where you only make it to the squad and not the playing eleven, you tend to get frustrated. But I have been working hard and just focusing on cricket. Without thinking about the selectors, I am just focusing on my game. I understand the importance of fitness and hence I have been sweating it out in the gym as well. What are your thoughts on T20 Mumbai as a league? The T20 Mumbai League has been an amazing platform for all of us to showcase our talent. It was a good tournament for me and I would like to come back stronger in the next edition. Who do you consider as your role-models in the game? I have been extremely fortunate to have my coach Mr Satish Samant alongside me who is responsible for everything I have learned in the game. Also, my batting coach, Mr Vinayak Sawant has played a huge part in helping me develop my skills. Where do you see yourself as a cricketer in the next five years? I want to continue working hard on my game without any set goals in mind. But having said that I am looking to maximize the opportunities in the coming editions of this tournament and try and breakthrough into other quality teams.